Mosaic tile floors includes any tile that is less than 2 inches square, although they could also be round or hexagonal. Mosaic tiles can be either glazed or unglazed, and they're usually mounted on 12-x-12-inch sheets with a mesh backing. Mosaic tiles are usually made of porcelain, although a few are regular ceramic. If you have a ceramic tile shower in your home, chances are the floor is covered with mosaic tiles. In some homes, the entire bathroom might be done in porcelain mosaic tiles, but this tends to look more commercial. In fact, you'll see porcelain mosaic tiles in almost every commercial restroom covering the floors and the walls. Porcelain mosaic tiles are colorful, extremely durable, frost-proof, and a good choice for most applications, including kitchen countertops. In the case of unglazed tiles, the color goes all the way through the piece, so it'll never wear out. 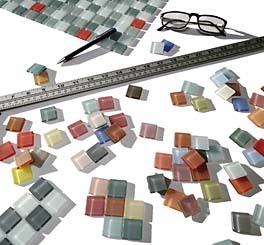 Trim pieces are available for many mosaic tile lines. For more information on this and other ceramic tile flooring products... FloorBiz is your starting point to all the important mosaic tile flooring sites on the internet.